As Vice President Digital Signage at Ultrahaptics, newly hired Greg Patrick leads a cross-functional organization with global market responsibility. The team consisting of sales, marketing, product, and technical resources are all fully focused on winning high-impact projects with significant recurring revenue potential. Although new in this role, Greg of course is no stranger to our industry, whether that be AV, digital signage or DOOH and in fact has been at the forefront of a number of industry revolutions; including AdTECH in his role with NEC Display Solutions’ VUKUNET – which, as has been proven most recently, was about five or six years head of its time, Ed. With decades of experience in the display electronics industry, Greg has held key executive business, sales, and marketing positions at a couple of global manufacturers including Barco, NEC Display Solutions, and Sharp Electronics. Most recently as Vice President Digital Cinema Lobby at Barco, he and his team developed the business model and strategy to digitise cinema lobbies and launched the Barco Lobby Experience, a fully immersive digital lobby that engaged and entertained moviegoers with larger-than-life digital displays. Central to that digital lobby strategy was the One Network Alliance, a coalition of partners that bundled products and services for a one-stop solution. When he was General Manager of NEC’s AdTECH Platform VUKUNET, one of the really early entrants in the DOOH programmatic ad-buying space, Greg led strategy, business management and customer engagement activities for ad agencies, brand advertisers, and DOOH ad network operators. 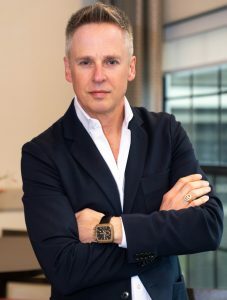 Greg has spent the majority of his career leading the introduction of new products and services, often in emerging markets, by focusing on the development of ecosystem partnerships and strategic alliances necessary to establish profitable sales channels and earn the products ‘right to play’ in the space. At Ultrahaptics he is driving strategic planning and tactical implementation for all DOOH activity. It is no surprise then that the Ministry of New Media invited Greg to present in London on Wednesday May 15 at the Global Digital Signage Conference. His presentation is titled ‘Putting Touch Into Brand Touchpoints‘ and will be a great opportunity for attendees to grasp (no pun intended) what 3D gesture and haptics is all about! This entry was posted on Wednesday, April 10th, 2019 at 15:40 @694 and is filed under DailyDOOH Update. You can follow any responses to this entry through the RSS 2.0 feed. You can leave a response, or trackback from your own site.